Rehab Or Die: It's our six year wedding anniversary today. Yeaaaaah!! Love is in the air... along with a whole lot of water. 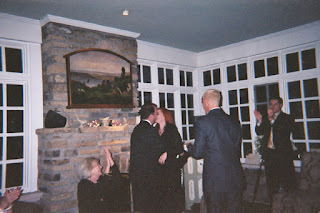 Six years ago today, on a Saturday the 14th... (day after you-know-what) my DH and I invited our close friends and family to a celebration of our marriage, which, they all thought, had happened the previous month in an odd and disappointing eloping to the Sevierville, TN Smoky Mountains. Well, it didn't happen then or there. We had a surprise wedding. 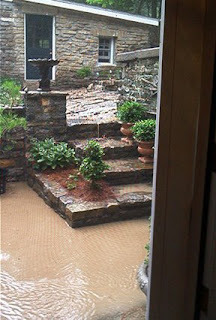 But the real surprise was the uninvited guest... four inches of rain within 30 minutes. The water was pouring down the hillside, and the pressure of the moisture coming through the rock walls was making the water squirt sideways through the retaining walls. We didn't get any good pictures of the actual monsoon, I think we were all just too stunned. 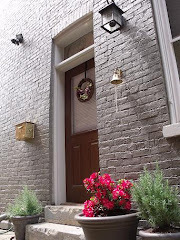 The pictures above are looking out the front door onto the veranda where we planned to serve hors d'oeuvres. 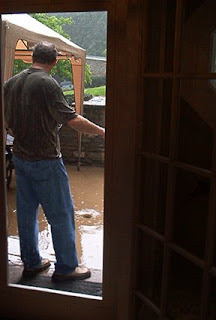 The water/mud almost made it into the foyer. We had tents outside to keep the sun off of guests. We thought they were waterproof. They weren't. Sister of the groom: "What's plan B?" Groom: "This IS plan B." Needless to say, once the rain stopped, cleared out the humidity, we quickly had dinner around the pool, and then, just as dessert was to be served, the rains started again. So we had our guests grab their spoons and head back into the house, where we made our announcement. "We didn't want to get married without all of you there.... so we didn't.... but now that we have you all together, we thought we'd do it now." And so we did. Thanks to all of our accomplices: Ab, Andrea, Rob, Steve, and Pete. But now, every year, on our anniversary, it rains. A lot. One of more fun episodes was "A Surfeit of H2O"
Well, Happy Anniversary! Rain is the bringer of life.. a good omen, I think! So far, so good. At the very least, it makes for a great story!